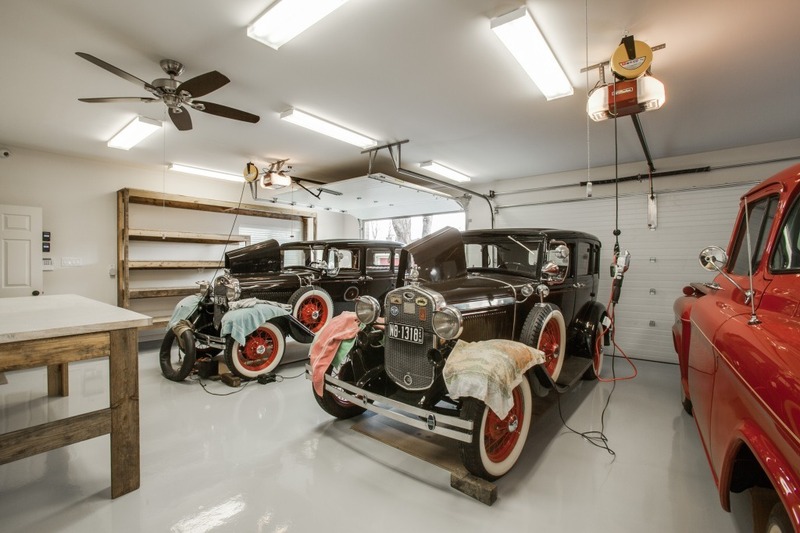 Click on the picture to see more of this custom garage workshop. You may use your garage to store vintage vehicles, or for some other kind of work space or storage. In fact, many households use the room strictly for extra storage space. No matter how you use yours, a well-appointed garage will make your life easier. Whether you’re building a new garage or sprucing up an older one, organizing your possessions; dividing the area into dedicated work zones; installing effective lighting; and choosing the right flooring will make your garage an effective area. No matter your garage’s age or size, it’s a useless space if you can’t easily find the things you’re storing in it. Use every inch of available space wisely; even rafters and floor-to-wall space. If you’re cleaning out an old garage, take out every item and set it outside. Donate items in good condition, which may qualify for tax deductions. Make a pile of things that need to be thrown away. Only put items back in that you will honestly use. What do you use your garage for? What do you dream of using it for? Dividing it into work zones helps you envision its potential while giving each item a place it belongs. That also just happens to make clean-up easier, too! Take everything outside. Sort your items into different piles, and then figure out what zones are best for your situation. Where lighting is concerned, halogen bulbs work nicely overall if you’re using your space as a workshop and need light for more detailed projects. You can use xenon bulbs as an alternative if you don’t want the heat that halogens give off. Halogen and xenon bulbs last longer than conventional incandescent bulbs and are a bit more efficient. Fluorescent lights work well for more detailed projects, like on workbenches or under cabinets. They don’t give off much heat. An ugly floor can make your space seem old and dingy. The most budget-friendly option to transform a floor is to fill cracks and paint the floor using a latex acrylic concrete paint. Keep touching up areas by scraping peeling paint, cleaning, and then reapplying paint annually. Premium epoxy systems may not be as easy to apply to concrete floors as paints, but they give your floor a durable, scratch-resistant surface. And, they last longer. Specialty mats can simply be laid on the floor either covering the cracks in old floors or helping to protect new floors. Laying down interlocking floor tiles can be a comfortable option that adds comfort, especially if you have a work bench that you’ll be standing by on a regular basis. Polished concrete has an extremely durable finish that won’t need a lot of maintenance. It will add pizzazz, and it will be a great way to show off any classic cars. Save your time and sanity: The key to a well-appointed garage truly is having a spot for all of your items. Turn your garage into a space you’ll be proud to show off. Contact us today at 972-377-7600, or click here to request an estimate.